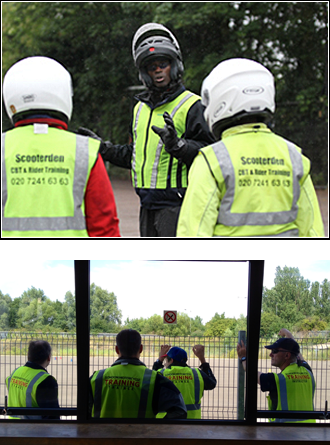 London Motorcycle Training provide Full Motorbike Training from our Central London location. from training schools when things have changed in any way. This is how we do our training… All prices quoted are inclusive of VAT, bike hire, insurance, petrol, and helmet & glove hire. ride a geared 125 if you are 17 or older. plenty to get you through. The closest centre to central London is near London Bridge. Once you have your CBT and theory book in for 2 days training. This will cost £350. You have 3 choices. carry passengers, use motorways and remove your L plates. There is a minimum age of 17.
to take the 600cc test at 21.
are up to. This is the point where you book your module 1 test. Module 1 – Test charge is £15. This is the off road element of the test that has the swerve test and emergency stop. to discuss with your instructor. but if you are doing the test on a big bike you will need an instructor to take you. Again this will be £125 for half a day. Mick or Tim on 020 7241 1111, and they will be happy to clarify everything and make the bookings for you.